The Florida Keys are a popular destination year around, but during the winter months you'll find hotels at their most expensive. They also fill up early during this peak season. Many avid divers head to the Florida Keys because they're an easy alternative to the Caribbean for tropical diving. Dive resorts are a great option if you plan to spend a lot of your time in the water. They often offer special deals to guests on dives and the attached dive shops are very knowledgeable and reputable. Dive resorts can range from luxury to basic. Some resorts offer other activities as well such as kayaking, snorkeling, swimming and island tours. Restaurants are sometimes attached that provide guests with convenient meals. Some of these resorts have dive shops and facilities attached, while others work in partnership with nearby dive shops. The diving in the Florida Keys can be impressive and interesting. Whether you're a first time diver or very experienced, you're sure to have a great time on your dives throughout the Florida Keys. 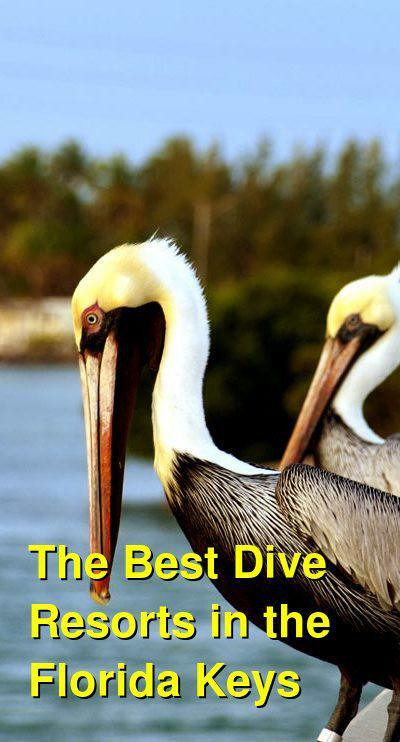 This dive resort is a favorite because of its easy access to some of the best diving in the Florida Key's. It is located on Key Largo very close to the MarineLab Undersea Laboratory, Christ of the Deep, and Dolphin Cove. It is also not far from John Pennekamp Coral Reef State Park. The facility is built surrounding the dive deck. There are two dive boats available and a few simple amenities that appeal to avid divers. There's a full service dive training center, dive gear storage lockers, a sun deck, and a heated pool. The newest of the two boats is a small "six pack" style boat that is available for private charter or snorkeling tours. There are also ecotours available. The larger boat leaves every morning at 8:30 am and 1 pm for diving trips. Night dives are also scheduled when there is a demand. The rooms themselves are not luxurious, but there are thirty options that range from a simple hotel rooms to full appartments with kitchens. This resort is about much more than diving. It really has something for everybody. Hawks Cay Resort is located on Duck Key just a couple of miles from the Dolphin Research Center and the Curry Hammock State Park. It offers a private beach as well as five different swimming pools, a steam room, sauna, and a fitness area. It also has a saltwater lagoon that lets guests interact with dolphins. For families, there is also a children's camp where kids can have a great time. For divers, there is a professional dive team to help you organize your trip. They cater to a range of levels so everybody from beginngers to experienced divers can take advantage of all that the reef has to offer. You can explore deep water wrecks or try your hand at SNUBA, for those that aren't yet ready for the full diving experience. SNUBA does not require a course or certification so it is available to everybody. Scuba diving lessons are available and the staff are reassuring and knowledgeable and will work hard to make sure you have a fun and safe time. This dive center lets you experience the best of Looe Key National Marine Sanctuary. It's well established and has been around since 1978, making it one of the first in the area. They offer two daily trips, scuba diving lessons, and snorkeling trips for those not interested in diving. The motel is one of the most affordable in the Florida Keys. In addition to the full service dive shop, there is a pool, tiki bar, restaurant and nightly entertainment. Every room is furnished with a flatscreen television, cable TV, microwave, coffeemaker and free wireless internet. The tiki bar serves breakfast, lunch and dinner as well as a daily happy hour. This resort is located right on the water in Islamorada. 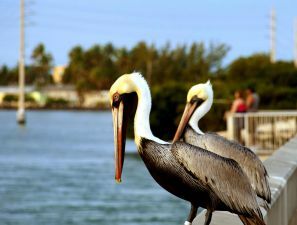 It's conveniently close to Founders Park and Windley Key Fossil Reef Geological State Park. It's also close to the History of Diving Museum. The resort has its own marina and plenty of amenities for guests. These include free internet access in the public areas, wedding services, spa services, barbecue facilities, a grocery store, and parking. The guestrooms are fully air conditioned and are equipped with cable televisions, kitchenettes, refridgerators, microwaves, and cooking utensils.